Reports this week suggesting that Instagram’s adoption of video has seen use of Twitter-owned Vine “tank” are wide of the mark, or at least premature, according to new information. Facebook-owned Instagram introduced the option to record 15-second-long video to its wildly popular photo-sharing service this month. With 130 million monthly active users, it has a user base that is significantly larger than Vine, which recorded 13 million downloads when it launched an Android app in early June. Given the differences in scale, it was easy to nod along when Marketing Land provided graphical evidence that Instagram’s sparkling new video service was eating into use of Vine. As shown below, the chart from analytic firm Topsy chart appears to show that the number of links to Vine videos on Twitter dropped off right after Instagram got video. The free Topsy service generates trend charts using a sample of the most influential people and tweets. This allows users to see emerging trends among influencers in real time. The company’s premium Pro service does count all of the links posted to Twitter — by influencers and regular folk alike — and its chart of Instagram and Vine URL sharing paints a very different picture. 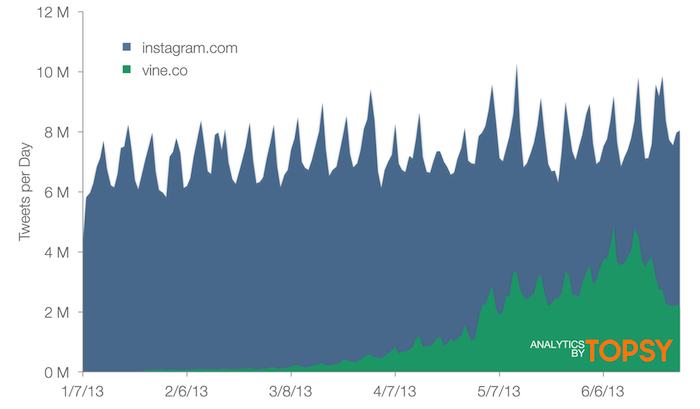 One that does not show Vine taking a hit on usage since ‘Vidstagram’ launched. In fact, it shows that Instagram has led the way consistently. Despite the significant gap in overall users, the number of links to Vine on Twitter topped 4 million per day on two occasions following the app’s launch on Android. That usage has tapered off a bit — that’s to be expected since new app and platform launches typically prompt anomalous spikes — but, when Vine did hit that 4 million peak, its total number of links was nearly half of that which Instagram saw during the same period. That’s pretty impressive. The sum of the charts is that, as AllThingsD points out, there is no winner for now. But there is one more important point to make: making grand assumptions from links on Twitter does not reflect all users and activity on Vine or Instagram. Twitter — though a daily essential for many — has just south of 200 million monthly active users. That’s actually less than messaging service WhatsApp — which reports 250 million monthly active users — and of course Facebook has more than 1 billion users who go to its service per month. Analyzing Twitter links, while an interesting and doubtless informative activity, does not tell the full story since Twitter is just one popular way of communicating and sharing online. The ground is particularly uneven on Twitter because Instagram no longer supports Twitter Cards, albeit through its own doing. Since December 2012, users of Twitter.com and official Twitter apps no longer see photos or videos within their Timelines, as they do with links to Vine, Twitter’s own photo service and others that support Cards. There’s been plenty of debate about how the loss of support for Cards affected sharing to Twitter from Instagram. While there’s no concrete proof either way — speaking for myself, it’s meant I share less, despite workarounds — it isn’t level to compare a non-Twitter optimized service with one that is owned by Twitter, and thus obviously optimized and likely well-used by Twitter regulars. In short, it’s time to stop comparing Instagram and Vine using Twitter. However, since a balanced comparison requires user metrics from both sides and Twitter’s data is open than Facebook and others, I don’t anticipate that media will cease hitting up Topsy or other analytics services to pit the two video apps head-to-head — in spite of the inherent flaws.